Whether you're interested in a bit of inspiration, motivation, degradation or deprecation, I'll keep you on your toes and challenge you to face change head-on with a healthy dose of insight, foresight and prescription. My primary signature keynote presentations are loosely based on my three books, "Life after the 30-second spot", "Join the Conversation" and hot off the press, "Flip the Funnel: How to use existing customers to gain new ones." What if we got it all wrong? What if we've been going about marketing completely the wrong way? In this provocative keynote, Joseph Jaffe will outline how retention can become the new acquisition for businesses today and in doing so, literally transform the way companies go to market and establish a critical competitive edge and advantage. Using his new “flipped funnel” methodology, Jaffe will outline the notion of customer experience, introduce the 10 new rules of customer service and present a social media-powered customer activation model that harnesses the true potential and impact of customer-generated word-of-mouth, reviews and referrals. If “getting more from less” has become your new mandate, you won’t want to miss a new approach which presents the possibility of doubling your revenues whilst halving your budget in the process. For too long loyalty, customer service and relationship marketing have been thought of as passive, reactionary and/or defensive tactics. No more. In a world that is becoming ever more transparent, networked and dynamic, listening and responding has become a cultural imperative. But the real question is, “with whom?” And the answer is an unequivocal, “our customers”. In fact if you think about it, without our customers we have no business; we have no budget to invest in acquisition or awareness efforts. If this is in fact the case, why do we continue to throw good money after bad wooing strangers with no overt or explicit affinity towards our brand? Why do we relatively ignore our lifeblood – our customers? What would happen if we turn conventional business practices on its head and in doing so, elevate CRM, loyalty and retention marketing to head of the class; from back to front office; give it its deserved seat at the strategic planning table? What might the result be? Flip the funnel and you’ll find out for yourself! This is no longer your grandfather’s customer service. With the explosive and exponential advances and evolution in technology innovation and adoption, companies have limitless opportunities to connect with their customers in unprecedented ways. No longer considered to be a cost center, but indeed a strategic imperative capable of building the business – efficiently and effectively – from the inside-out. Using a revolutionary “flipped funnel” methodology, author and thought leader Joseph Jaffe will introduce and outline how customer service 2.0 – and its umbrella parent, customer experience – can become a powerful 1-2 punch capable of profoundly differentiating a brand from its competitors, establishing powerful relationships with customer evangelists and influencers and more importantly, arming this base with tools, techniques and incentives to spread word-of-mouth, recommendations and referrals to social networks, trusted peers and communities. 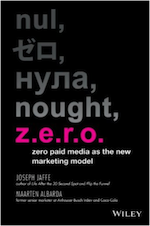 Continuing the conversation (literally) about how new forms of marketing are transforming the way brands are introduced, nurtured and strengthened, Jaffe introduces “what comes next” i.e. the rise of “conversational marketing”. The central message is simple: There are literally millions of alive, flawed, human, passionate, influential and authentic conversations going on around you right now: isn’t it time you joined in? The fact remains, all the marketing communication, media, messaging and advertising in the world can only get you so far. At worst, breaking down the door (there will be repercussions!) At best, getting a foot in the door. After which, conversation takes over. Through the power of community, dialogue and partnership, marketing can be a conversation; a welcome guest in the homes, experiences and lives of our consumers, if – and only if – certain principles, pathways and philosophies are put into practice. It’s a double-whammy – a catch-22. You see the world changing in front of your eyes – consumer empowerment, democratization of creativity and content production, loss of control, reduction of trust in a new social media playing field dominated by new phenomena (microblogging, lifestreaming), new players (Facebook, Twitter), new products (Amazon.com Kindle), marketplaces (iPhone App Store) and technologies (Nintendo Wii) – and all the while, spinning out of control at the same time. You’re under increasing and unprecedented pressure to increase sales or at the very minimum maintain status quo, amidst never-ending budget cuts and scrutiny. Innovation and Experimentation are vital and yet seemingly out of reach. Well here’s the good news – investing in “commitment-based” marketing and coping during a recession are not mutually exclusive. In fact, they’re interconnected. By “joining the conversation” through leveraging the power of community, dialogue and partnership, you’ll quickly find yourselves on the right side of the “punch” – the 1-2 punch of growing your business and differentiating your brand from your competitors. Centered around his first book. Jaffe discusses the demise of the 30-second spot as the primary communications vehicle and in its place, the rise of bold alternatives to traditional advertising (the “93 colors”) such as interactive, experiential marketing, long form content, communal marketing, gaming, and on-demand viewing. You’ll be introduced to new models such as E.P.I.C., R.E.A.C.H., C.O.S.T. and R.U.E., amidst a cacophony of real-world illustrations and pragmatic and prescriptive advice on how to win in a world where the only constant is change. Of course, there are also custom presentations should you so desire. You can also check out my web video show, Jaffe Juice TV, for a bit more juice. So I've been traveling like crazy (hence the non-existent blogging and podcasting), but I have been capturing video throughout my various journeys around the world. Delivering a new podcast and a new partner! On Friday of last week, I recorded my last "Across the Sound - The New Marketing Podcast" ever. The podcast I began 2 years ago with Steve Rubel, named "Across the Sound" as Steve lived in Long Island and I, in Westport, CT, hit 93...falling 7 shy of the big 100. Starting today, Across the Sound is rebranded and renamed as....Jaffe Juice (ta-da!) Sounds simple enough...and it is. For all the right reasons, it made total sense to bundle and consolidate both social media assets (blog and podcast) under one umbrella brand. I'm looking into forwarding/redirecting the feed (I believe that's possible) which seems like the obvious solution. Another one is just to subscribe to Jaffe Juice in iTunes (or your favorite podcatcher) - the direct iTunes link is here. Also, if you're not a listener, take this opportunity to subscribe and give it a shot. And so, if you want to get the Juice, you can in its two forms: text and audio (and who knows....shudder...and some point soon, video as well...which is a bad idea as I've been told I have a face for radio) Jaffe Juice - the New Marketing Podcast will continue where ATS left off as JJ #94. Each week, the editorial team at Deliver will send in an audio vignette, which will focus on a common area of interest in the field of innovation. I will respond to the question, comment, and/or meme and then invite the Jaffe Juice (ATS) community to do likewise. I'll also be contributing 6 articles to the magazine and 6 thought leadership pieces to Deliver's website over the next 12 months. To kick off the association, I'll be signing books tonight at a USPS reception. The folks over at Deliver Magazine, USPS, Campbell-Ewald (USPS' agency) and myself have worked hard at this and I'm really proud of where we ended up. It's further proof that podcasting is real, substantial and valuable. To be honest, I never thought I'd be on this side of the equation, but irrespective I now have my own example (from the inside-out) of a podcasting sponsorship outside one of the anemic handful of ones usually brandished about. It's a strategic and integrated initiative and I truly hope (I have a say in the matter) it "delivers" (sorry) the goods and the value that is being sought from this conversational experiment. One thing that is also very cool is how open everyone is to this being an evolving association i.e. letting it unfold and grow naturally. 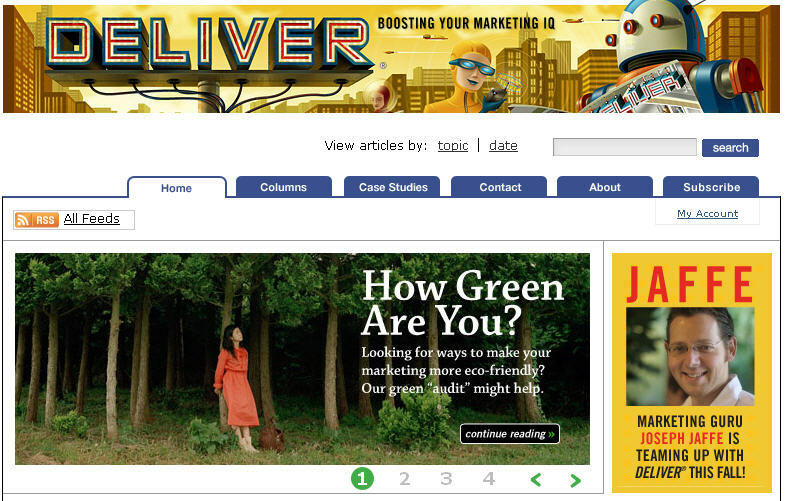 fyi - check out Deliver Magazine and give it a trial (the subscription is free) It will surprise you big time. You can also subscribe to the feed. Nice! The Radio Music Awards (on TV!) came and went. I clipped a sound byte and shared it with Adam Curry. He played it on Delta Sierra Charlie 303 and I'm sharing it with you in the form of a Juice to Go. Is Google the new Gator? Seems like the world is quickly turning against the mighty Google. USA Today reports on Googlemania becoming Googlephobia...and in a Juice to Go, I ask the question (with the help of Adam Curry), "Is Google the new Gator?" The tyranny of ignorance or the pendulum swinging back to equilibrium. You hear...you decide. 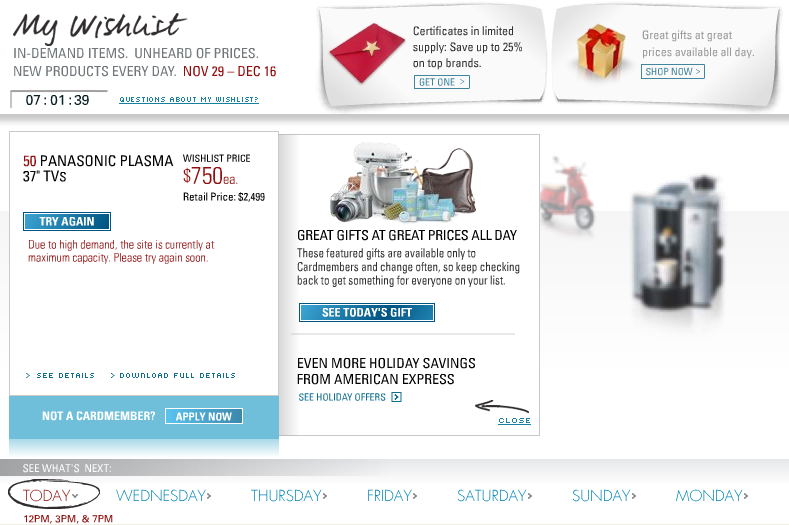 Juice to go Podcast: Check out Amex's new campaign "My wishlist" which quite frankly left me wishing it would just go away.